Golfers at all levels demand the finest golf course conditions at all times. No matter the weather conditions or time of year, golfers demand perfection. One of the critical elements to keeping cut quality at a premium level is bedknife maintenance. 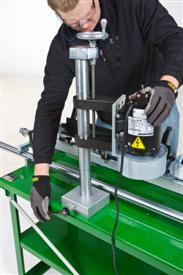 The Frontier BG1000 packages precision with an easy-to-use manual grinder setup that is quick and efficient. There are two principle bedknife angles, the top angle and the front angle. 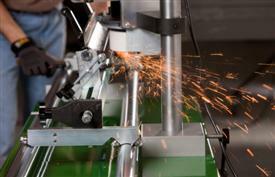 Each angle serves a purpose that impacts the overall cut quality. The top angle provides clearance for the clippings to eject after a blade of grass has been cut. Without this angle, grass tends to get pinched instead of sheared since it is difficult for the grass to eject. In addition, the top angle is important in eliminating metal-to-metal contact across a wide range of bedknife attitudes. The top angle must be present and should be maintained according to the manufacturer’s recommendations. The top angle also combines with the front angle to create the actual cut point. The front angle is important for allowing the reel to present the grass to the bedknife to be cut. The rake angle of the reel pulls the grass toward the bedknife. If there is no front angle on the bedknife, the tendency is for the bedknife to push the grass forward, making it difficult for the grass to be properly cut. The front angle prevents the grass from being pushed over, allowing for a premium quality of cut. The front angle is also important as the cutting unit must be set up to perform correctly across a wide range of bedknife attitudes. Front facing is the most common maintenance practice performed on bedknives, and can have the most detrimental impact on life and performance of the bedknife. When facing a bedknife, it is important to remove as little material possible. Removing large amounts in a single grind shortens the life of the bedknife and increases the aggressiveness of the bedknife attitude. If a cutting unit gets too aggressive, the reel tends to make more of a rotary impact cut instead of a precision cut that may result in increasing the number of stragglers, brown stripes in the overlap, or just an overall deterioration in cut quality. No matter what top and front angles are chosen to maintain the bedknives, the BG1000 is up to the task. And if an operator ever experiences a cut quality issue and needs to restore the bedknife back to manufacturer’s specifications to get a baseline, the BG1000 provides that capability quickly and easily. A critical element to proper grinding is the performance of the carriage and rail system. The BG1000 features precision ground 4.45-cm (1.75-in.) diameter hard-chromed steel rails for increased accuracy when traversing the carriage back and forth for grinding. For smooth and efficient operation, the carriage is guided by roller bearings. A convenient handle located on the carriage allows for easy use and simple manual speed control for a consistent grind time after time. A stationary grinding head provides consistency and accuracy from grind to grind. The grinding head is adjustable to bring the grinding wheel toward or away from the bedknife to accommodate different bedknives. It also includes an adjustment to move the grinding head up and down to make the grind more or less aggressive. The enclosed grinding motor features 0.5 hp at 3450 rpm. An adjustable wheel guard is provided for added protection. The grinding wheel measures 15.24-cm (6-in.) outside diameter by 3.18-cm (1.25-in.) inside diameter with a 5.1-cm (2-in.) grinding face. The wheel is a type 6 white vitrified with 46 grit for optimal grinding performance. Maintaining proper bedknife angles is critical to maintaining a high quality of cut for the life of the bedknife. The Frontier BG1000 provides an easy-to-use mounting system that provides required precision to meet demanding course conditions. The mounting system consists of adjustable cone supports, a middle bedknife support, and a top support bracket. 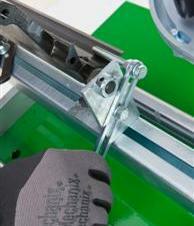 The center cone supports adjust to accept bedknives and bedknife shoes of various widths. The cones are used to support the ends of the bedknife shoe to secure the bedknife to eliminate any side-to-side movement while grinding. The middle bedknife support is adjustable and establishes the resting point of the bedknife when tightening the cone supports. The top support bracket rests in the gutter of the bedknife and secures the front of the bedknife against the middle support. This mounting system is simple without sacrificing any accuracy. The cone supports, middle bedknife support, and top support bracket combine to secure the bedknife rigidly for a precise grind. 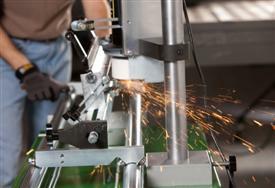 For increased bedknife angle accuracy, an alignment gauge is located on the grinding head motor. This gauge is used to square the bedknife for proper grinding. 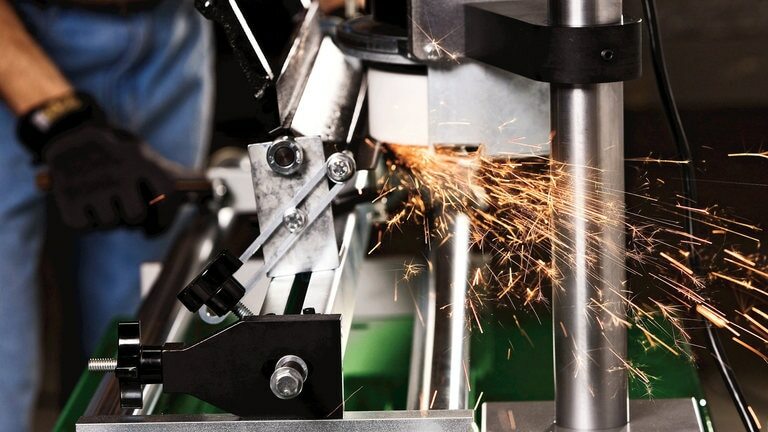 It ensures alignment of the bedknife in both the horizontal and vertical planes is true for accurate grinds. Adjustable knobs on the trunnion bar allow each end of the bedknife to be correctly aligned to the alignment gauge. 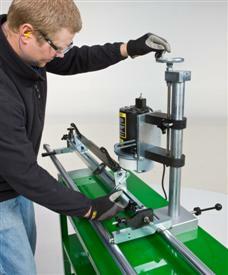 An angle indicator is used to set the angle of the bedknife for grinding. The angle gauge is placed on the top cutting edge of the bedknife. Adjustable knobs allow for rotation of the trunnion bar so the bedknife angle can be set to angles established by the manufacturer. A manual dressing brick is provided as standard equipment to utilize whenever any glazing is present on the grinding stone. 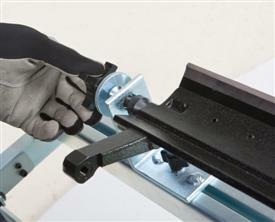 Glazing is the buildup of stone dust and grinding grit on the face of the grinding wheel. To dress the wheel, move the carriage to one end and carefully hold the brick against the grinding wheel while the grinding wheel is rotating.